Given that I’ve written about both Small Batch’s coffee and about places serving Small Batch, I thought it about time that I wrote about Small Batch itself. For those who don’t know, Small Batch is a well-established and well-respected roaster and coffee shop chain in Brighton & Hove, which I covered on one of my first assignments for Caffeine Magazine. In all, there are four Small Batch coffee shops in Brighton and Hove, with coffee stalls at both Brighton and Hove stations, and a roastery/café in Hove. Naturally, this being the Coffee Spot, I started at the end, not the beginning, visiting the newest Small Batch of all, the Norfolk Square branch. On the busy Western Road, between Brighton and Hove, this might be the most beautiful of all the Small Batches. Located in an old bank branch, it is an elegant, bright, high-ceilinged space, enhanced by an island counter that subtly dominates the room. There’s a range of seating, including at the counter itself, where you can watch the espresso machine in action or marvel at the brew bar on the opposite side. You can also sit outside if you wish. 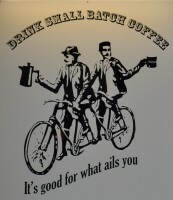 And, of course, there’s Small Batch’s excellent coffee. Norfolk Square, sloping down towards the sea, is on the southern side of Western Road, the main thoroughfare linking Brighton & Hove, situated near the boundary between the two towns. A bank used to occupy the western (Hove) side of the square, on the corner of Western Road, but in a move that can only be applauded, it turned into the latest branch of Small Batch two years ago. This, by the way, was an old-fashioned, elegant branch of the type that still graces many high streets around the country and Small Batch has made the most of it, retaining several original features. If you fancy sitting outside, there’s a row of three four-person tables on the busy Western Road (one for each floor-to-ceiling bay window). Alternatively, there’s a quieter option, a terrace overlooking Norfolk Square, where there’s a bar lining the railings either side of a short flight of steps down to the pavement. You enter via the main door on Western Road, although, if you like, you can use the French windows on the terrace. Coming in the front door, you immediately turn right and through another door (a legacy of the bank) which you arrive at the front of the main room, which is roughly square. The counter’s to your left, a horseshoe-shaped island, open at the back, with the cake cunningly placed on the front corner, directly ahead of you. How did that happen, I wonder? Turn left, where you’ll find the till, menu and ordering point, cakes now to your right, espresso machine to your left. Behind you are two high, communal eight-person tables with high bar-chairs, one either side of the French windows opening onto the terrace. Alternatively, against the wood-lined back wall, beneath a painted Small Batch logo, a long, padded bench with several four-person tables runs along the left-hand part of the wall. If there isn’t space there, there’s another padded bench, this one with two-person tables, on the opposite side of the counter. This runs the full length of the right-hand wall, beneath two long mirrors. If that wasn’t enough, you can also try the two-person table in one of the Western Road windows or you can sit on a bar-chair at the counter. Take your choice of the front, where you have both espresso machine to your left and brew bar to your right. Alternatively, you can sit at the brew bar itself and get a close-up view of your (and everyone else’s) coffee being made. However, don’t do what I did and arrive at five o’clock expecting filter coffee; the brew bar only operates from 10-4! Denied my hoped-for pour-over (a choice of Peruvian or Bolivian through either Chemex or V60 during my visit) I chose an espresso, made using Small Batch’s standard Goldstone Blend, which I know well and really enjoy. I wasn’t disappointed, my (double) espresso served in a surprisingly large cup. The first mouthful was really bright, but by the third (and final) mouthful it had mellowed wonderfully. My friend had a cortado, pronouncing that it went equally well in milk. We felt obliged to try the wonderful cakes, with my friend opting for toasted banana bread, while I selected something sweeter, a lemon meringue tart, with great, crusty pasty and a lovely, creamy meringue. If you enjoyed this Coffee Spot, check out the rest of Brighton and Hove’s speciality coffee scene with the Coffee Spot Guide to Brighton & Hove. This entry was posted in Brighton & Hove, Cafe/Roaster, Cake, Coffee Shops, Coffee Terraces, Evening Opening, Island Counters, Retailers and tagged include, Small Batch by Brian Williams. Bookmark the permalink. Looks like a beautiful coffee shop! Well honestly for me coffee is my one true love and coffee does make me feel refreshing. Moreover the view that you are mentioning is just beautiful and on Sunday I also use to visit place like this.